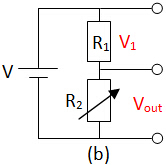 A potential divider is a simple circuit with resistors arranged in series to obtain a fraction of the main voltage provided by a voltage supply. The voltage is divided between the resistors; the greater the value of the resistor, the bigger the proportion of the voltage it will take. 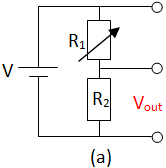 The output voltage, Vout is used to drive another circuit. Note that with two fixed resistors, we always get the same Vout unless we replace the resistor with one of different value. We can change R1 or R2 to be a variable resistor so that we can easily vary Vout without replacing the resistors. Case (a): When R1 increases, what happen to Vout? Case (b): When R2 increases, what happen to Vout? Current decreases as V = IR. 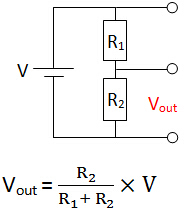 V1 decreases as V1 = IR1 and R1 is a fixed resistor. (1) We have to make sure one of the quantities is a constant. For example, in case (b), we cannot conclude directly Vout increases or decrease when current decreases as both current and R2 change. (2) We have to reason it with current. We cannot simply use the potential divider formula to explain. A potentiometer is a variable resistor that is connected at three terminals shown as points A, B, C. Contact C is a sliding contact. 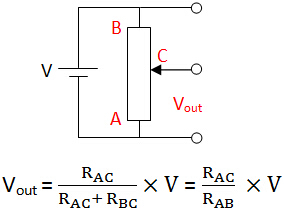 The position of C determines the ratio of resistance of AC to BC since resistance is proportional to length (R = ρL / A) for a fixed cross-sectional area. RAB is always the sum of RAC and RBC. When RAC increases, RBC will decrease or vice verse. No matter how you move the sliding contact C, the current passing through the potentiometer does not change as both emf and RAB does not change. When C is moved towards B, what happen to Vout? When C is moved towards A, what happen to Vout? Vout decreases as V=IRAC and I is a constant.